How Managers can access & track their team's Self Reflections. 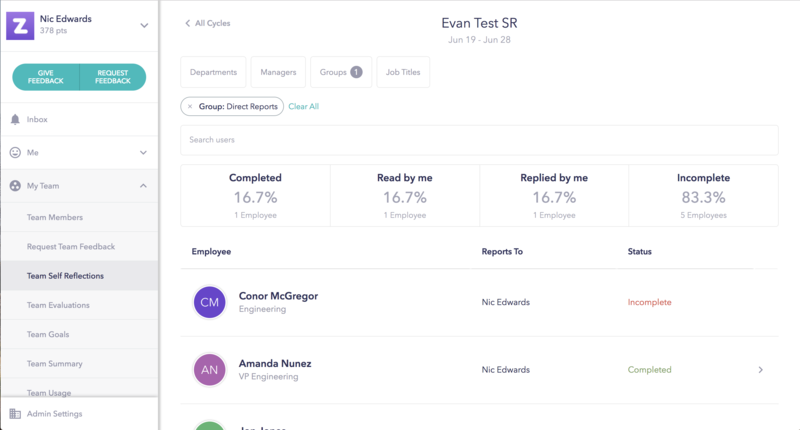 As a manager, you'll be notified when your direct reports have completed their Self Reflections via email and inbox notifications. We also provide an easy way to view the overall completion rate and actions that you've taken on your team's Self Reflections. Completed: Your Direct has finished their SR and you can view it now. Read by me: You've opened your direct's SR and have reviewed it. Replied by me: You've replied to your direct's SR. Incomplete: Your Direct has yet to complete their SR. If you click on these boxes while viewing the status, it will filter the results. To access this, use the side navigation. From there, click on "My Team" > "Team Self Reflections". Click on the cycle you'd like to see. If they've completed the Self Reflection, you can click on their name and pull up what they wrote to read it. We encourage managers to comment back on self reflections to dig deeper into the reasons behind their answers (if not provided). Both managers and direct reports can comment on self reflections to add context and respond. If Admins have opted into providing prompts for manager's responses, you'll se prompts when commenting. View your org's Self Reflections - If you have indirect reports, you have the ability to see what they've written. This is found under "Groups"
Search by user - You have the ability to search individual members of your org. This is an additive search, so you can identify multiple individuals at once rather than searching one by one. Search by manager - You can search by manager to view their direct reports' Self Reflections. Searches can be additive - If you'd like to have multiple different factors taken into account, the search results will filter down based off of all the different tags that you add. That's all you need to know about managing your team's Self Reflection. Click on the link below to go straight to your Team Self Reflections page then select a cycle to view the dashboard.